The ultimate in jewelry magic! 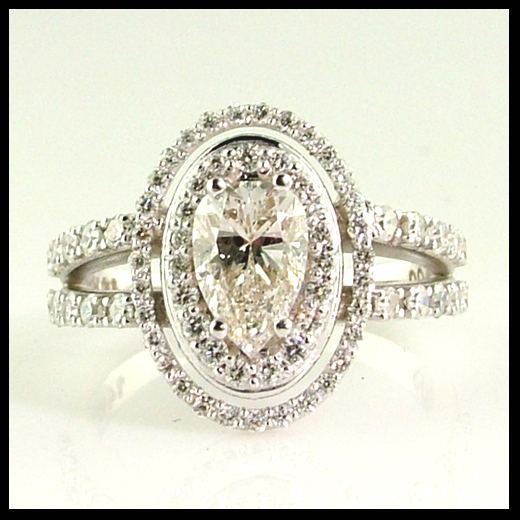 A gorgeous pear shaped diamond is transformed into an oval. Gail came to us recently with a baggie full of jewelry she found when she cleaned out her jewelry box. There were several gold chains, a diamond tennis bracelet and a few rings to boot. These were pieces that she didn’t wear anymore. Jewelry from the 80s, broken items, rings that didn’t match her style anymore. And she had her wedding ring – a very pretty pear shaped diamond, set in 14k yellow gold. The problem was that she now preferred white gold jewelry. It goes with everything, and can be mixed easily with the more fashionable, sterling silver jewelry that she often wore. She loved her pear shaped diamond, especially since her husband had scrimped and saved to purchase it years ago. But she also loved the look of an oval diamond. 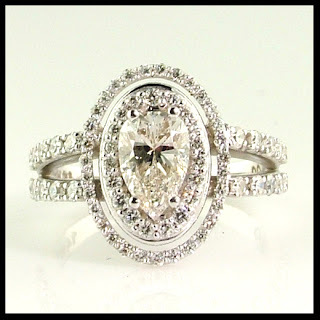 Scott and Gail worked together using Scott’s Custom Jewelers CAD technology, and designed a stunning, 14k white gold diamond ring that made her pear shaped diamond turn into an oval. They decided on a unique, double halo effect to really accentuate the oval shape, and used more diamonds on the split double band. Best of all, most of the diamonds came from her own, unworn jewelry! The new custom wedding ring is not only gorgeous, but goes with everything. And because she recycled so much of her old jewelry, it was very affordable. Spring cleaning has never been more beautiful.